For over 4000 years ceramic grills have been used to cook, grill and smoke in India, China and Japan. After the Second World War the ceramic grill evolved from Japanese cookers known as Mushikamados into the modern Kamado. 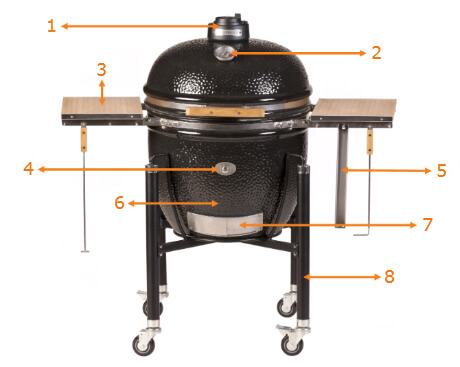 Monolith took this one step further and developed their very own version of the Kamado grill. This ceramic grill delivers on all its promises – grilling, smoking, baking, cooking, barbecuing or roasting. It brings together the best of the world’s grilling techniques. Combining BBQ grill with pizza oven and tandoori oven, it is an outdoor cooking appliance capable of tackling every world cuisine. The Monolith range combines German design, efficiency and attention to detail with ceramics that we are proud to say are made in China using ancient and traditional techniques and materials. With this method the grill rack is placed on the fire ring over the hot coals. The food must be turned in order to be grilled from both sides. This set up gives a more traditional BBQ experience. The deflector stone is placed on the fire ring over the hot coals, protecting the food from the direct heat. The grill rack is raised with the distance piece. With indirect grilling you can cook large pieces of meat, whole fish and poultry gently on low temperatures. 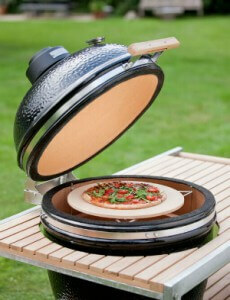 The pizza stone is raised with the distance piece and the Monolith is preheated to 300°C – 350°C. Authentic Italian stone baked pizza cooked over charcoal and even traditional breads are easily achieved with this set up. 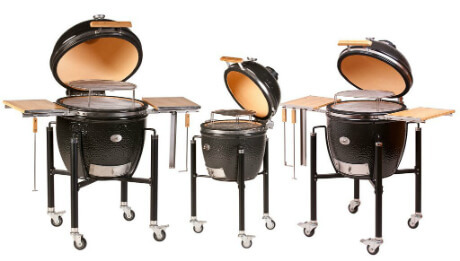 Different options exist for smoking food – smoking with wood, wood chips or wood flour. After heating the grill up, close the air regulator, thus minimising the intake of air. By adding different kinds of seasoning or spices destined for smoked food, you can change the flavour of your meal as you wish.